The 2-in-1 market has been heating up tremendously over the last few years with contenders such as Microsoft, HP, Asus, Lenovo and many, many more all turning out impressive devices that challenge the traditional laptop-tablet divide. Although ceasing production of laptops, Samsung’s tablet offerings have gone from strength to strength, arguably being ahead of the game for a number of years. 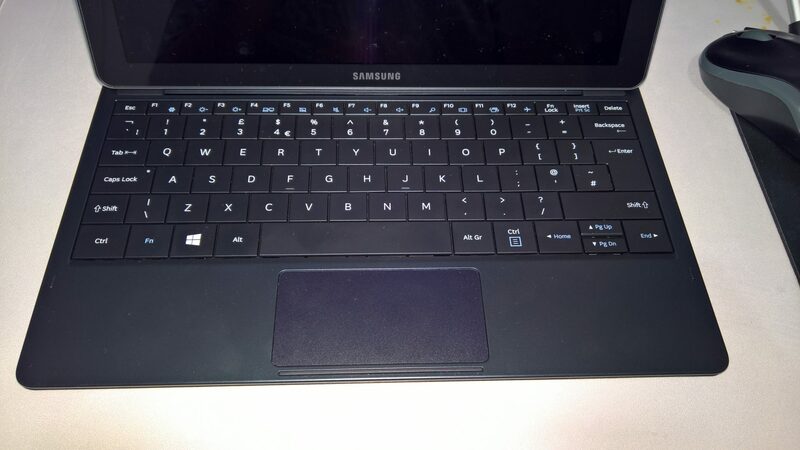 Although not the first Windows tablet Samsung has released, the converged market offered a perfect opportunity for them to bridge the divide by bundling a keyboard with their latest offering. With it they’ve secured a nice corner of the market for themselves with what I’d consider to be one of the thinnest and lightest 2-in1’s I’ve ever used. Over the New Year the price of the TabPro S was significantly reduced (no doubt to clear stock for the yet unannounced TabPro S2) from a whopping £849 down to a far more reasonable £500. After giving up on the Linx 12V64 I jumped at the chance to try one out. 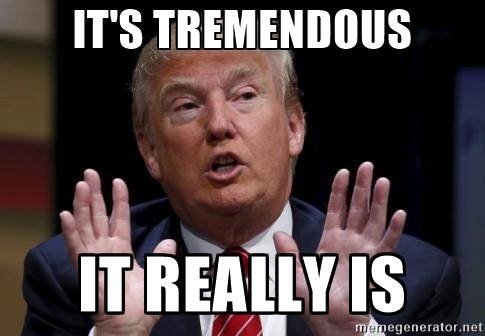 Now over a month later, here are my thoughts. 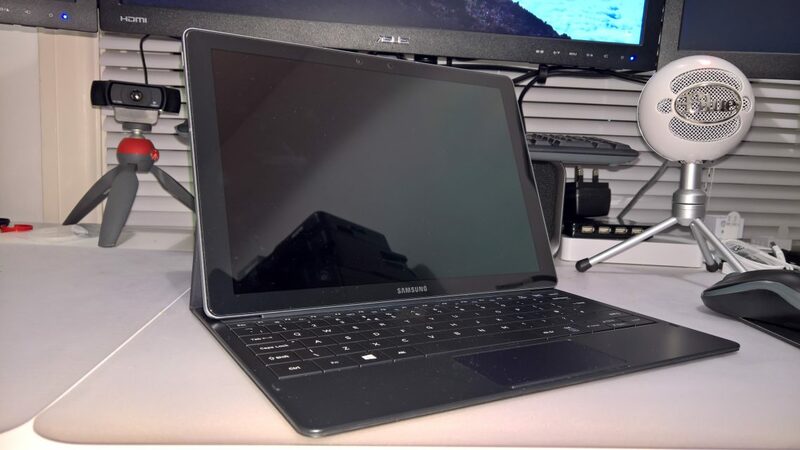 Like many Samsung tablets, the TabPro S is a mixture of metal and plastic; while the outer rim of the device feels exceptionally premium with its aluminium frame, the back is the typical, slightly flexible plastic. Admittedly it’s almost never seen with the keyboard in place but at the price Samsung launched the TabPro for I’d have liked to see an all-metal finish akin to the Surface. Unlike the Surface however, the TabPro does come with a keyboard as standard (but no pen, that’s sold separately for a hefty £45 at the time of writing. I have one on the way..). Across the top of the device are the power and volume buttons. Down the left is the physical start button (which is still a thing) and on the bottom sit the pogo pins for the keyboard. The physical buttons on the TabPro are satisfyingly clicky and responsive. As far as physical dimensions go, it boasts 290 x 198 x 6.3mm and 693g – it is unfathomably thin and light, largely thanks to the 2.2GHz dual-core Core-M under the hood requiring passive cooling rather than needing to run a fan, even under load (though it does get rather warm to the touch occasionally). The keyboard case adds very little bulk when connected also, resulting in a tablet that always feels like I’m carrying almost nothing around when travelling. In terms of ports, there’s really nothing to list. 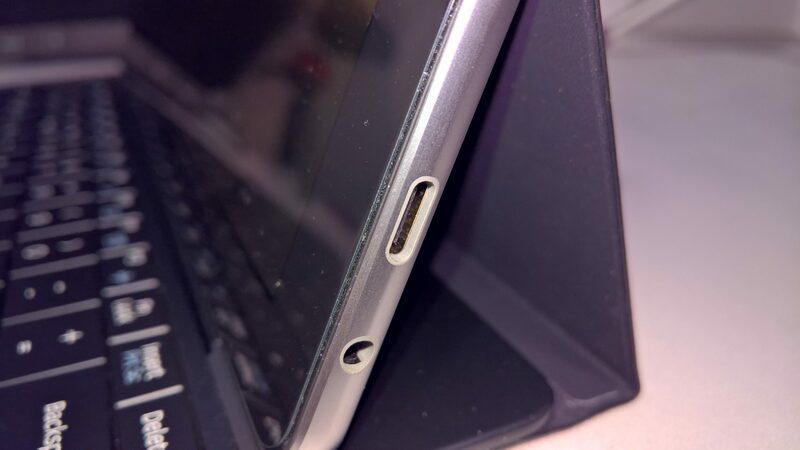 It has 1 USB type C port and a headphone jack. 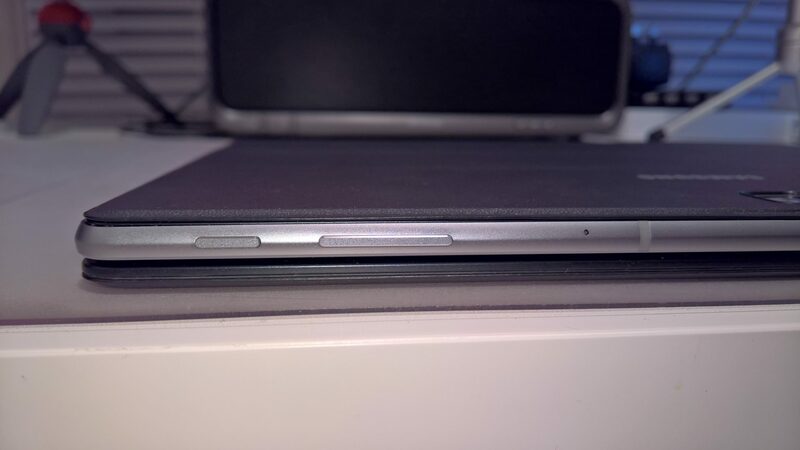 Being somewhat vocal about Apple’s decision to limit the ports on the new MacBooks obviously this is even worse; with only one port I have to decide between charging the tablet or doing basically anything else. Naturally there are dongles, but I haven’t gotten around to picking a decent all-in-one dock just yet. On the plus side, the port supports quick-charging, offering a full charge of the 5,200mAh battery in a couple of hours. 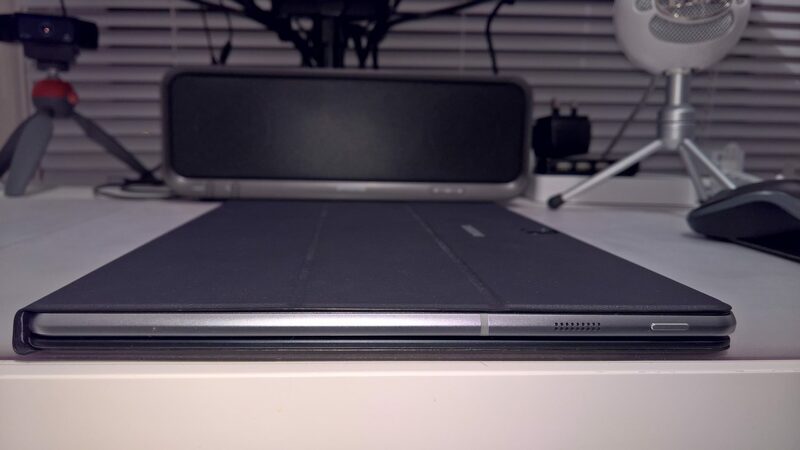 I often feel with tablets this is the wrong way around; I, like many, won’t take photos on a tablet for a few reasons and therefore don’t make use of the better rear sensor, while video conferencing with family and colleagues tends to suffer by comparison. The TabPro S boasts a 5MP camera on both sides. They’re as good as each other! This means whether you are indeed taking a photo at the zoo or conferencing a team remotely you can guarantee the exact same picture quality and resolution. Thank you, Samsung! On a full charge I generally see a full day of mixed use (and often more since I have another laptop for work during the 9-5). Under more intense usage I can watch the battery slowly draining away significantly faster, though this isn’t a recurring scenario and still offers me better battery life than most of my other devices. On the inside, as mentioned above, the TabPro S uses a 64bit dual-core Core-M processor with 4GB RAM and 128GB storage. Under normal usage (writing, browsing, image editing, etc) it’s more than capable, however I do occasionally notice Chrome tabs reloading in an effort to manage with the limited memory available. In an ideal world and certainly for the price I’d have hoped to see 8GB RAM; it’s not a costly upgrade for a manufacturer and makes all the difference in the world to the experience for consumers. Alas, I’m not prepared to pay out the extra required for the Gold edition (which also boasts a larger SSD), so 4GB will have to be enough. Over all I haven’t noticed any considerable slow-down, stutter or otherwise poor performance in daily usage. It’s worth mentioning the usage I’m referring to is almost identical to that of which the Linx 12V64 was subject to, and that did suffer pretty considerable performance issues. I’ve been very pleased with the TabPro by comparison. The 12″ FHD+ (2,160 x 1,400) sAMOLED screen is easily the best looking display I’ve used on a Laptop/2-in-1 device to date. Colours are vivid (if a little oversaturated), bright and offer excellent viewing angles. At this resolution images are crisp and clean. It’s a stunning display to work with. The sAMOLED panel is unique in this market otherwise filled with IPS and TN displays, but it comes at a cost; Samsung’s power management defaults to dimming the display after 30 seconds of inactivity by default, a rather irritating “feature” when watching a video or reading a long-form article. This is done to lengthen the life of the panel, one that is otherwise susceptible to screen burn-in if not properly taken care of. Thankfully Samsung allow this to be extended to up to 10 minutes which is more than enough for me generally, though those doing presentations or watching longer videos will still suffer. It’s not possible to disable it entirely. For me, it’s a trade-off I can live with; for the benefits of sAMOLED I’m prepared to more actively care for the panel. 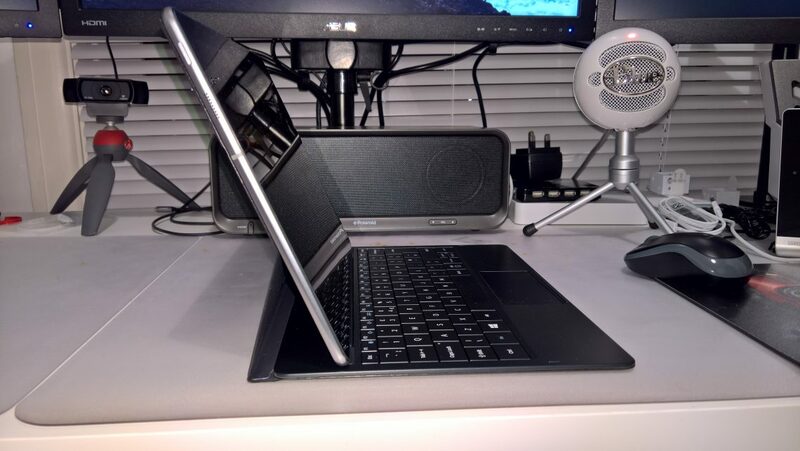 Unlike other 2-in-1’s the TabPro S comes with a keyboard out of the box. No additional cost. When considering the Surface Pro keyboard is around the £100 mark on top of the already expensive tablet itself, it’s satisfying to have one included in the price with the TabPro. 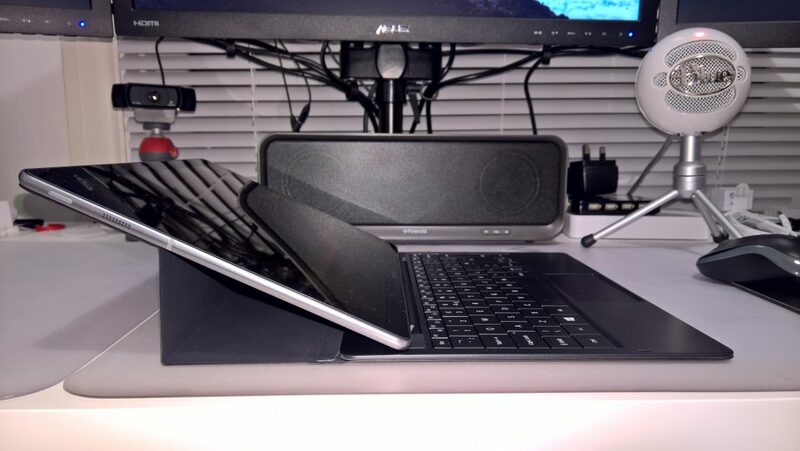 It’s a little more than a keyboard too as it acts as a folio case, protecting both the front and the back while propping the tablet up in 2 distinctive angles for easy viewing. It attaches to the tab with reasonably strong magnets and stays put quite well. Admittedly it took me a couple of hours to get used to the compact layout, the Surface keyboard benefits from spacing between keys however this is not the case with the Samsung. All the same once I was used to it there was absolutely no issue. I do find the angles to be slightly too extreme in many circumstances; sitting it upright for example is a little too upright on anything but a flat desk, and laying it on the lower angle I’ve found is only really super useful for typing in bed, on a lap or anywhere else I’m not necessarily sat up straight. There’s also the issue of balance. As the tab is only held up by magnets any decent knock has the potential to push it out of place, causing the tablet to topple over; it could definitely benefit from a little more work here as a couple of times I’ve moved the tablet about on a desk or chair with a little too much haste and had to catch it mid-fall. The keyboard itself has minimal flex, ample key travel and is very responsive. I thoroughly enjoy typing on it. At the original list price of ~£849 I considered it far beyond my humble budget, instead looking at more conventional laptops with far better spec for the same price. Even now at between £649 – £700 on Amazon it feels quite costly. On the other hand it’s cheaper (currently) than a similarly spec’d Surface Pro, particularly as it comes with a keyboard folio case out of the box, and is possibly one of the thinnest and lightest 2-in-1’s I’ve ever laid my hands on. The hardware under the hood will by no means blow anyone away, though for what it is and what it’s designed to do it excels. If I had the choice between the TabPro S and the Gold Edition with additional RAM before purchasing I would have naturally opted for the better spec, but the tab doesn’t feel as though it’s struggling and therefore isn’t a cause for concern to me. Since purchasing the TabPro S I’ve put my other laptops up for sale, they’re now surplus to requirements as the TabPro S does literally everything I want in a portable device and is so easy to carry around I rarely feel the need to opt for anything else. Do you have a TabPro S? How are you getting on with it? Let me know in the comments, @jasonbayton on twitter or @bayton.org on Facebook.